Handheld Addict is now merging with Palm Addict to become one PDA site. The old Forum will also be mantained. YOU WILL BE AUTOMATICALLY REDIRECTED. Some PDA news of a device running Windows CE. 5.0 "NEC Infrontia has announced a new PDA called the “Pocket@i EX” that is equipped for industrial use. In addition to being able to withstand a 5 foot drop to solid concrete, it is dust/waterproof, and can allegedly be used even while wearing gloves. Things get more industrial when you learn about how it will be available in four different models: one for scanning barcodes, one for scanning QR codes, one for RFID tags, and one with no scanner at all. Sure, it leaves a bit to be desired on the technical end with a screen resolution of only 240 x 320, but given the applications of the device, that’s probably not a huge deal. Runs Windows CE 5.0." Taiwan’s First International Computer (FIC) has upgraded its AquaPAD webpad; the AquaPAD+ now includes 802.11g WiFi, IrDA, PCMCIA, USB, VGA output and embedded Linux, powered by a Transmeta Crusoe running at 800 MHz to 1 GHz. The 2.6-pound unit has an 8.4-inch 800x600 touchscreen display, and can also run Windows XP, XP Embedded or CE (it includes a CF/Microdrive slot as well). More on this over at the Engadget website. We have talked about the Pepperpad before and it looks like that Walt Mossberg is not too happy with it according to Engadget. "Good ol’ Walt had a look at the Pepper Pad, the Linux-based tablet device that wants to be a simple, convenient tool for surfing the web and playing digital media around the house. Mossberg’s not so hot on it, though — he reports it’s not as easy or intuitive to use as claimed, and that many of the built-in applications seem limited and rough around the edges." 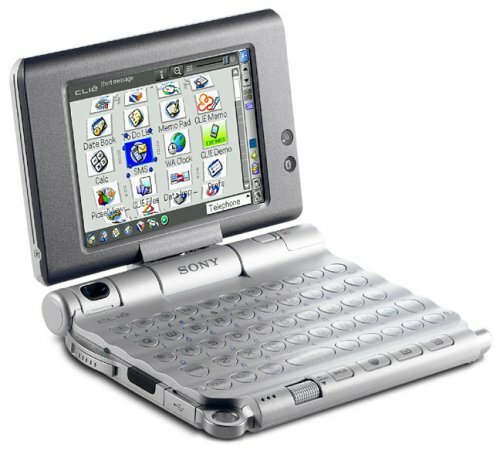 For those interested in what a Palmtop PC is like, Mike Cane has given me the heads up that the OQO has been reviewed over at The Register today. "There's no denying that the OQO Model 01 is one of the coolest devices that I've ever got my paws on. It is an amazingly compact yet fully featured PC, in a very similar vein to the Sony Vaio U series. However, there are some obvious advantages that the Model 01 has over the U70P. Top of that list has to be size: the Sony was pretty close to pocket size, but the Model 01 really is. I've been carrying the Model 01 around with me for the past couple of weeks and it fits snugly into my back pocket." Sony breeding an OQO competitor in the U? The Engadget reports, "They could have made it happen in the PEG-VZ90 (let alone the U series, no doubt), but rumor has it—now don’t get too worked up, this is totally unsubstantiated—that Sony’s planning a U series update that may well combine the early (like the now discontinued U101, right) with the late (U50, U70, etc.) of the line on something of a keyboard equipped palmtop with a swivel screen—in other words, something to really take on the OQO." "Symbol Technologies, Inc. (NYSE:SBL), The Enterprise Mobility Company, today introduced the MC1000, a new value-priced enterprise mobility tool designed to improve operational efficiency in the retail, manufacturing, warehouse and logistics industries. The new MC1000 expands Symbol's rugged mobile computer product portfolio with a cost-effective, feature-rich handheld device that enables organizations to automate processes and efficiently capture data. "The new MC1000 handheld computer provides an enterprise mobility tool to address our supply chain and customer demand chain needs," said Kevin Huang, IT operations manger, ICI Paints. "With a highly ergonomic and lightweight design, the MC1000 provides an affordable solution to reduce employee training requirements and increase productivity and profitability. ""The device runs Windows CE .NET 4.2. More on this over at Pocket PC Thoughts. This over at Engadget this morning. Microsoft has released Windows Automotive 5.0, a new version of the Windows CE-based OS for embedded car computers. According to the company, the latest rev includes new tools for developers, such as a new UI toolkit, as well as support for Bluetooth, WiFi UPnP, USB, XML, SOAP and other common standards. Not Handheld related but I still thought it was interesting. Engadget picks up on this. "We’ve got a feeling they spent more time developing this one than they did thinking of reasons it should be developed (uh, yeah, you know what we mean), but Sharp’s announced a new dual-displal technology (which Babelfish translated to “veil view”—we kinda like it) capable of showing completely different screens at different viewing angles. Apparently with mass production already started, Sharp wants to get these things in notebooks asap—but we can’t help but wonder if their reasoning is a little flawed." Looks like those rumors of a delayed launch for the Clio NXT were right, after all. The long-awaited successor to the cult Windows CE-based laptop/tablet was due out in April, but manufacturer Data Evolution now says the NXT won’t be available until the fall, due to engineering delays. More on this over at Engadget. Tekguru are talking about a new Pocket PC slated to appear later this year called the HTC Universal which will run Windows Mobile and have a clamshell design with what looks to be a very good keyboard. Kinda reminds me of the Psion handheld which also had a clamshell design. Darren from DC & Co. released the second beta of iSilo and iSiloX V4.27 today. More at MobileRead. TextMaker and PlanMaker can now be had for less than US$25 or EUR 25. Even better: Each additional eligible product is priced at just US$10 or 10 Euros! But hurry: This sale lasts only one week! TextMaker is a lightning-fast and reliable word processor, needs little memory, and offers the rich feature set of Microsoft Word. Most importantly, TextMaker reads and writes all Microsoft Word files from 6.0 up to the current Word 2003 seamlessly. TextMaker is available for Windows, Linux, Pocket PCs, Handheld PCs, Windows CE.NET, Sharp Zaurus, and FreeBSD. PlanMaker offers the feature set and ease-of-use of a modern high-end spreadsheet application and is closely modeled after market-leading Microsoft Excel. Its key features are more than 320 calculation functions, seamless import and export of all Microsoft Excel files, fully Microsoft Excel-compatible charting, and full support for Microsoft Excel's AutoShape drawings. If you can do it in Excel, you can do it in PlanMaker! PlanMaker is available for Windows, Linux, Pocket PCs, Handheld PCs, and Windows CE.NET. TextMaker and PlanMaker are available with user interfaces in English, German, Spanish, and Portuguese. Translations into French, Russian, and Simplified Chinese are under development. Expansys at the moment are selling HP Jornada 680e's (English - Factory Recon.) for the low price of £153 which wayyyyyyy cheap. A very good price. More details. The link between the PDA and the notebook is getting even closer with the Flybook. Dialogue presented its fully-functional 9”x 6” laptop at Computex. The Flybook weighs in at 2.6 pounds, will have a 1.1-GHz Pentium M “Dothan” chipset and up to 512MB of RAM. Bluetooth, SM card slot, and built in WiFi capabilities are also included.More over at Gizmodo. Last fall, Sharp introduced the Zaurus SL-C3000, which was one of the very first handhelds to have a built-in hard drive. Now, the company has announced a slightly updated version of this model. Like its predecessor, the Zaurus SL-C3100 will include a 1-inch hard drive that can hold 4 GB of data. Both models use a clamshell design with a 3.7-inch, 640-by-480-pixel (VGA) screen on one side and a keyboard on the other. In addition, their screens can rotate and then be closed down over the keyboard. More over at Brighthand. A SmartRider in Every SmartCar? Stephen Trew dropped me a line to point me towards this Linux Clamshell PDA called The Unication Magpie. "Anyway, while we’re on the topic of Linux-powered clamshell PDAs, is this that “VOIP PDA” that Unication was showing off at Computex last week? Not 100% sure, but the Magpie does look about the same and it does come with built-in VoIP software. Besides running on Linux, the Magpie also has a 200MHz processor, built-in 802.11b WiFi, a mini QWERTY keyboard, an FM radio transmitter (which is a little unusual for a PDA, but whatevs), stereo speakers, and an SD memory card slot." More details on the Engadget site. The Clio NXT is back in town?The Clio NXT is back in town? Is Microsoft Downsizing the Tablet PC? according to eWeek it may well be the case. "First it was the slate. Then it was the PC-Tablet convertible. Now it's a mini-Tablet that can do everything that a traditional Tablet PC can do, plus store electronic books, that could end up as the new gadget on which Microsoft is betting to further Tablet PC momentum. A prototype of a new device—described by sources as a type of hybrid Tablet PC/eBook—has been making its way around the Microsoft Corp. Redmond campus, according to sources. The mini-Tablet, which measures about six inches by eight inches and features a digitizer, is just one of a number of new Tablet form factors expected to debut in the coming months." Tony Atkins dropped me a line to point to this editorial over at Pocket PC Magazine about reading ebooks on your HPC. "Electronic books have become the new technological “Beanie Baby.” Everyone has heard about them, not everyone is excited about them, but a devoted core of users has discovered a new digital promised land of literature. Last March, for example, Steven King published a short novel, Riding the Bullet, as an e-text for $2.50. Two and one-half requests per second were received initially, causing network slow-downs and crashes around the country. Specialized websites now aggressively recruit would-be authors who can have a real opportunity for self-publishing." Good to see another update to iSilo yesterday. "iSilo™ is a highly versatile document reader available for Palm OS®, Pocket PC, and Windows® CE Handheld PC handhelds, as well as for Windows® computers. You can find thousands of ready-made documents downloadable immediately for reading with iSilo™ or you can create your own documents from HTML content using iSiloX. " Metro has been updated today. With new additions cities added. Yesterday I bought an MS-DOS guide.Yesterday I bought an MS-DOS guide. and many of theese are freeware. With the new support for 386/486 processors you can expand the compatibility even to the newer applications and maybee hope to run a good dos game too ;)"
Having been away for a few days skiing I am now back faced with a wonderful deluge of your emails which I will go through tomorrow in the meantime I spotted this over at Pocket PC THoughts today. "[T]here's something inherently appealing about ruggedised gadgets nonetheless. Maybe it's the bright colours, or the rubbery exteriors, or maybe it's just the promise that you can bash them about with no recriminations. Whatever it is, we're feeling enthusiastic about Gotive's H41 ruggedised PDA. As well as the GSM/GPRS data and voice capabilities, the H41 comes with a GPS function, Bar Code Reader and MMC and CF card slots. It's weather and drop resistant and the connectors are described as "unbreakable" which is surely asking for trouble. It runs on the WinCE NET OS and includes all the usual PIM software. It's pricey though - £990 excluding VAT from Smartdevices."" More details. Good morning, I am pleased to be able to offer a contest this morning. In association with our sister site Palm Addict, Handheld Addict would like to give you the chance to win a PDA device of your choice, this can be a new HPC or any preferred device. All you need to do is send a contribution into the Handheld Addict site and we will draw a winner at random. Email your contributions to sammymcloughlin@mac.com. I will draw a winner at the end of next month. Please put HPC contest in your subject line so my email inbox picks up on your mail. Thanks to Sez for his email "First of all hats off for a great website. Your site has opened my eyes to so many new things. Anyway I have just purchased a UX50 and love it. I love the clamshell design. 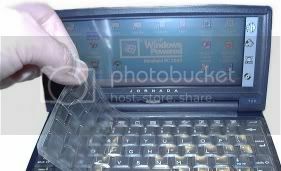 I have always been a fan of clamshell devices since I first owned a Psion Series 5. I used a Windows CE, The Jornada 720 for three years but wanted something with wifi and I was able to get this with the UX50. So thanks again for a great site and allowing me the opportunity to share my thoughts." This from Rich today "Just finished putting together a "do it yourself" file on how to take apart a Mobilepro 900/900C." You can see it here: http://hpcnec.com/900assembly.htm"
Palm OS? Windows Mobile? Why not Linux!Palm OS? Windows Mobile? Why not Linux! This over at MobileRead this morning "Tired of the endless discussions whether Palm OS or Windows Mobile is the preferred handheld OS? Perhaps you should consider buying a Linux-powered Sharp Zaurus handheld instead. Unfortunately, the default Qtopia desktop environment and the alternate OpenZaurus environment both lack the ability to run some specialized programs. The obvious solution is to install the X Windowing System on the Zaurus. The distribution Pocket Workstation is based on Debian Linux and can run in a chroot environment on a storage card, using the vendor's preinstalled native Linux system for most hardware access." I spotted this over at Engadget this morning. "One usually thinks of the accessories to a device as being smaller complements to the main show, but the Planon WebRacer dedicated web surfing device is intended as the big sibling for your cellphone. It’s billed as a “mini laptop” that basically adds a larger screen and QWERTY keyboard to your phone du jour. It hooks into your mobile via Bluetooth to glom onto its GPRS connection and get online action for the VGA 640 x 480 pixel color display." We've found time to add a BUNCH of NEW Keyboard Skin designs to our offerings! Many are popular Laptop models (check out our Keyboard Skins section in our OnLine Catalog). Seems that a number of our HP Jornada 720, NEC MobilePRO (790 and 900) and PSION NetBook military users have been boasting to their Panasonic ToughBook peers that our Keyboard Skins offer better protection from the local weather and atmospheric conditions of the Iraqi, Saudi and Afghani countryside. While not one of our customers had a problem with sandy grit getting under their keys - it seems that the ToughBook has been getting a serious beating! Must be, because we've been filled a NUMBER of LARGE orders to help protect the keyboards of those mega-dollar babies! What started as one or two orders - here and there, soon grew beyond our expectations! Now, not only are we getting regular orders of between 1,000 and 2,500 - just for the ToughBook, but also quite a few for Skins to protect a number of "civilian" style notebook computers... like Toshiba Satellites, IBM ThinkPads and Dell Latitudes, to name but a few. We've recently noticed that large orders of Keyboard Skins for handheld PCs have really picked up in the private sector... in BULK - for insurance companies, medical partnerships, teaching hospitals, pharmaceutical sales, home inspection, industrial design and universities. Even various Department of Homeland Security agencies that bought huge lots of inexpensive laptops are looking to extend their life - by protecting them with our Keyboard Skins! Keep in mind, our Keyboard Skins not only keep things like water, coffee, tea, soda, beer and the blowing grit and sands of the Iraqi desert OUT from behind the keyboards, but our protective keyboard covers also keep the occasional loose keys IN place and prevent them from getting lost! Remember, when you protect your expensive investment with our Keyboard Skins - like affordable "accident insurance"... you'll be "covered" when spills occur! Hope all's well with you! Engadget are showing the new Sharp Zaurus SL-C1000. "Looks like Sharp is going to tantalize us yet again with another PDA offering that we may never get our hands on in the States (at least not directly). The SL-C1000 looks to have similar specs to its cousin, the SL-C3000 but, rather notably, sans hard drive (which we can only hope will cut the price tag on this significantly, though no word on the dollar sign factor yet). It should have about 8 hours of battery life and 52MB user-area RAM." I just read this over on Pocket PC Thoughts that Activesync 3.8 is now Available in 23 Languages. "Microsoft recently updated Activesync to version 3.8 and they have now released it in a few (!) other languages. These include: Worldwide English, Chinese Simplified, Chinese Traditional, Czech, Danish, Dutch, Finnish, French, German, Hungarian, Italian, Japanese, Korean, Norwegian, Polish, Portuguese (Brazilian), Portuguese (Portugal), Romanian, Russian, Slovak, Spanish, Swedish, Turkish." More details. Has anyone tried GMail on a HPC yet? I am going to get a 728 at the end of the week but wanted your advice. Look out for an update of iSilo 4.25, read more. Thanks for the heads up J Kear who sent me the link to this great radio station guide especially for our UK readers which is basically a PDA friendly optomised website for live streaming UK radio stations which is so cool in my opinion. Also will work with other PDA's such as the Pocket PC and Palm. Point your HPC browser to radiofeeds.co.uk/pda and listen away. Hi Sammy, I have just posted an editorial questioning whether or not there really is a Clio NXT. More details. I would love to hear what Handheld Addict readers think! Rich from HPC Net has posted the end of line notice to the NEC900. Quite sad really. Thanks Rich for letting me know. More details. NS BASIC Corporation Announces Programming Contest!NS BASIC Corporation Announces Programming Contest! This time, we have three categories: Business/Enterprise, Games and Open. All registered NS Basic/CE users are welcome to participate in the contest. The prizes are $100 USD in each category. You may enter more than one program, but a program can only be entered in one category. Judging will be by NS Basic's experts. All judging is arbitrary and final. We will be looking at quality, performance, ease of use, sophistication and overall coolness. 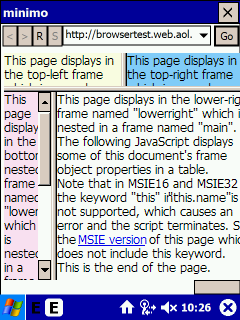 All programs must be written in NSBasic/CE, or be ActiveX controls for NS Basic/CE. Entries may be commercial, shareware or freeware. Please indicate with your entry whether we can share your program or screenshots with the public. We reserve the right to reorganize categories based on number of contestants. Send your questions and entries to contest@nsbasic.com. The deadline is March 31, 2005 at 12 midnite EST. * Business/Enterprise: Applications for business, government, education or the military. * Games: Fun applications for the Windows CE. * Open: Anything else, including ActiveX controls.